Party conferences are strange affairs. Once a year, half of Westminster decamps to another part of the UK to gossip, speechify and plan the future, with hundreds of party members, lobbyists and journalists in tow. This also makes conference season a good time to take the temperature of what different parties are thinking. Power to Change was in attendance, in a variety of ways, at each of the three main get togethers – so what did we learn as we tramped the mean streets of Bournemouth, Brighton and Manchester? Some good news – and it is very good news – is evidence that we are pushing at an open door with our bigger ideas about community business. This came through in specific fringe events, including those we hosted. Speaking alongside the Fabian Society and elected councillors and MPs at the Labour conference, there was a robust consensus that the old social model of ‘trickle down’ benefits for local areas – investment by government bodies which eventually works its way down to people in their communities – wasn’t fit for purpose (if it ever worked at all). Much more sensible was a lasting commitment to community control, with local authorities acting not to make every decision and deliver every service, but to support local people as they are entrusted with greater responsibility. And warm words about supporting communities were backed with some concrete suggestions about funding, too. Jim McMahon MP, formerly Leader of Oldham Council, recommended that a ‘chunk’ of the dormant assets fund could be diverted to create an ‘assets fund’, intended to hold for the community some of the UK’s £7 billion under-used assets. This would be a welcome development. We are working closely with Locality to push for greater support for community ownership of assets, and will be ramping up our own activity to grow community ownership during 2018. At Tory conference we approached the question of local control slightly differently. What did a focus on community-run libraries tell us about the localism agenda more broadly? Well, something positive. 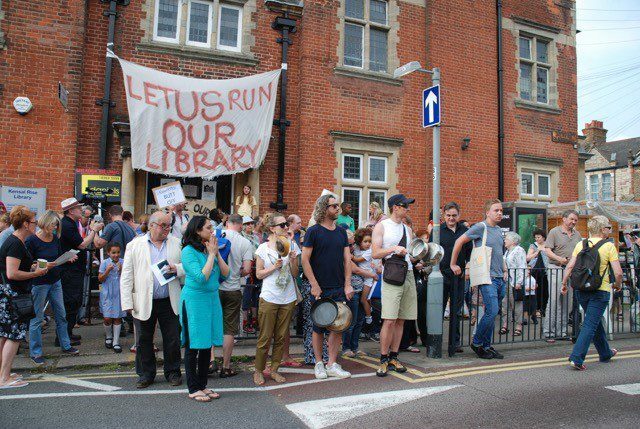 In numbers alone, the leader of Suffolk Council told us that, having let local people take over their libraries, use at these libraries has gone up and running costs have come down. This is positive for a library system which would otherwise be on its knees. And, as our Chief Exec Vidhya Alakeson pointed out, recent research has allayed fears over the quality of service delivery by community libraries. We believe there are transferrable lessons here for other areas where public service delivery is under pressure, and where community-run services can deliver a quality offer. And it is good news more broadly. As Cllr Colin Noble argued, regenerating libraries is also a way to build up community skills and capacity, which can then be applied elsewhere to strengthen the local area. Everything learned at a library needn’t stay there. Watch the event here. For those listening out for how politicians across the piece talked about local communities, all the conferences had something in common. Devolution is exciting for many – delegates flocked to hear from the new metro mayors – but so too are fears that another layer of bureaucracy is the last thing local communities need. Touring party fringes across the conferences, Lib Dems heard widespread annoyance that local people had been frozen out of decisions about their community for so long. A shadow minister at Labour argued that Labour would lose the next General Election if they didn’t engage people in the decisions which affected them. Tories were told that big international initiatives were unpopular because voters wanted to focus on what they could do to improve the things they cared about on their doorstep. The mood music is for change. Politicians get the benefits of a system where communities have real power, and where funders and local government are mainly relevant in helping local people get on with it. That is what we will be fighting to help create, because we believe that a refreshed localism agenda needs to start from the bottom up.